(Bloomberg) -- House Speaker Nancy Pelosi said Sunday she'd asked the U.S. Capitol Police to provide more protection for Representative Ilhan Omar after President Donald Trump tweeted a video of the lawmaker intercut with images of the Sept. 11 terror attacks on the U.S.
"The President's words weigh a ton, and his hateful and inflammatory rhetoric creates real danger," Pelosi said in a statement. Pelosi demanded that Trump take down the post, which had been pinned at the top of his Twitter feed since Friday. By mid-afternoon the message had been removed, although at least one other anti-Omar retweet remained in Trump's feed. And by then, the two-day-old video had been retweeted more than 86,000 times. Pelosi said in her statement that "following the President's tweet, I spoke with the Sergeant-at-Arms to ensure that Capitol Police are conducting a security assessment to safeguard Congresswoman Omar, her family and her staff." Friday's tweet wasn't the first attack by Trump on Omar, one of the first Muslim women elected to Congress. But it dialed up the temperature after the president a week ago mocked her in a speech in Las Vegas to a Jewish Republican group. Asked on "Fox News Sunday" whether Trump is worried he was inciting violence against Muslims or Omar, 37, a Somali-American who immigrated with her family to the U.S. as a teenager after living in a Kenyan refugee camp, Sanders said no. 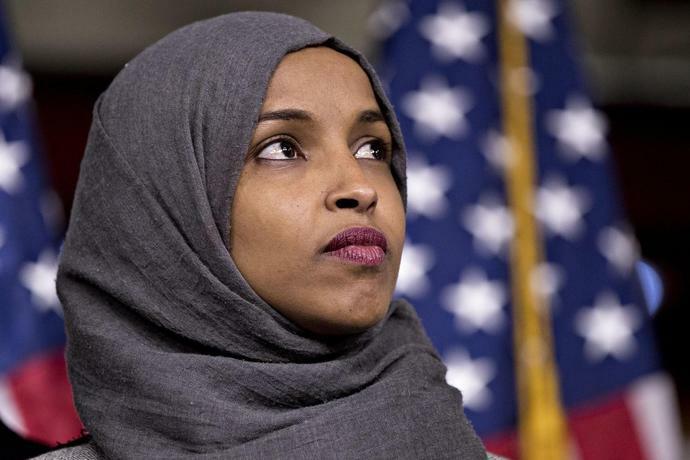 Instead, she blamed Democrats for refusing "to call" Omar for what she termed anti-Semitic comments. "Nothing could be further from the truth. The president is not trying to incite violence against anybody. He's actually speaking out against it," Sanders said on Fox. Representative Jerrold Nadler, Democrat of New York, said Sunday that the snippet of Omar's speech used by Trump came from extended remarks about discrimination against Muslim Americans after the Sept. 11 attacks.